"An easy entree with Mexican flair! Serve over rice or buttered noodles." Heat a greased skillet to medium. Rub chicken pieces with garlic, salt, pepper and cumin to taste; place in hot skillet. Cook until brown on both sides and no longer pink, 10 to 15 minutes. Transfer chicken to 9x13-inch baking dish or casserole dish, top with salsa and cheese, and bake in preheated oven until cheese is bubbly and starts to brown, 15 to 20 minutes. 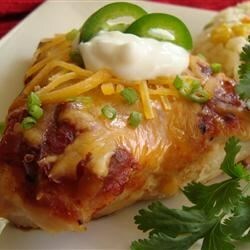 Seasoned chicken is topped with salsa and cheese and baked to bubbly.